Sunday: Since I had to film some stuff for Grove Lake, I get up early. While getting ready, I listened to Weekend Edition. One of my favorite singers, Emmylou Harris, was on the show, singing some songs from her new Songbird box set. As she sang, I actually tear up. God, I love that woman!...For the reshoot, I had to dig around some garbage for an establishing shot. I picked up soda cans, plastic bottles, and a corn husk out of a working trash can. I was only there for a few minutes and then we were done. The film crew got the footage they needed and I got garbage hands...I then went to the post office downtown to mail some bills. After grabbing a grilled cheese sandwich for lunch, I drove home. Out of the blue, I came up with a good idea for a comic strip. I decide to use the idea for this week's strip for All Access...I watched some of North by Northwest while I ate my grilled cheese. Cary Grant discovers George Caplin has dandruff...I took a nap. I wanted to go to Bob's Comic Castle so it had to be a short nap. It lasted five hours...Fully rested and newly hungered, I get up and order a pizza. I eat while watching the season premiere of The Simpsons. Despite an opening that featured a glimpse of Springfield after the big movie, the episode wasn't that great. Sorry, Spider-Pig! The new episode of King of The Hill seemed a little off for some reason though I liked it better than The Simpsons...I go online for some photo reference for the new strip. No e-mail. No new content at my favorite sites. Must you disappoint me, Interwebs?...Time to stop writing. Metalocalypse is on. Monday: Got up around 2:30pm to start the new day. It's time to go back to work...I spent nine hours at Touchy Feely Fotos and nothing I did is worth mentioning. Typical...I did find time to buy three Prismacolor markers. When it comes to markers, Prismacolor isn't my first choice (That would be Tria, of course! ), but they are cheap and they get the job done...Got to work on a strip! Tuesday: Spent the wee small hours of the morning working on this week's strip for All Access. It turns out to be pretty good and I'm pleased with it. I think it's going into the syndication package (You know the one I've been dragging out for the last decade? )...I'm on the road after seven to make a color copy of the strip (Reduced 64% from the original) for the paper. While I'm out, I also get some chocolate milk and a couple donuts I don't really need. I was almost tempted to grab a bagel, but I passed...Dropped off the comic strip at the newspaper and soon I'm in bed. It's a little after nine and I need to get some sleep!...The alarm goes off at 2:30pm, but I don't get up until three. Lousy job!...By the way, my dad is on strike...At work, I talk to Jenny and the Sesame Street movie, Follow That Bird, pops up in our conversation which reminds me you got to say yes when life says no. Wednesday: I don't want to get up, but I do. I don't want to shave so I don't. Today should be Thursday...Driving into work, I do a halfway decent Dr. Phil. I don't know if that's an accomplishment or not...Somebody leaves Touchy Feely Fotos in an ambulance. I'm leaving the building when I notice a small crowd gathering to watch an unidentified person hop onto a stretcher. When stuff likes this happens, people come out of the woodworks to gawk...That's all I got. Emmys: I don't know how it happened, but I ended up watching the big TV award show and it wasn't a bad way to kill ten hours (Seriously, it merely lasted six and a half). It was rather clunky in execution in some spots and, as to be expected, Ryan Seacrest was a banal host, but this year's winners were a fairly decent crop. Despite some disappointments (Sorry, Jenna! I was pulling for you!) and typical wrong-headedness (James Spader? Why? ), I was pleased with most of the results. Any year that has Terry O'Quinn and Ricky Gervais winning a winged statuette is a pretty good year for the Emmys. Mark Your Calendar: It looks like I'll be filming a reshoot this Sunday for the student film, Grove Lake. Better go press my overalls! 2007 continues to be a sad year for us Match Game fans. 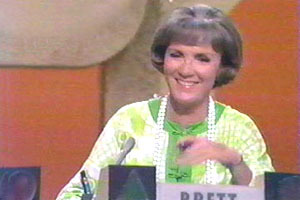 Earlier this summer, Charles Nelson Reilly signed off and now his partner-in-crime, Brett Somers, has followed suit. Part of Match Game's appeal for me was the bantering, battling relationship between those two panelists, sitting together on the top perch of that kitschy game show alter. They had good chemistry together. In fact, as a kid, I thought they were a married couple (Oh, the innocence of youth!). If there is a great Television City in the sky, I hope Chuck and Brett are sharing a good BLANK. Homecoming: David Letterman was in town Friday for the dedication of a building that shares his name at Ball State. Thousands showed up to hear him speak. I was at work. Cartoonist extraordinaire Dale Martin recently sent me a bundle of Watusi the Talking Dog comics which feature some of my scribblings! 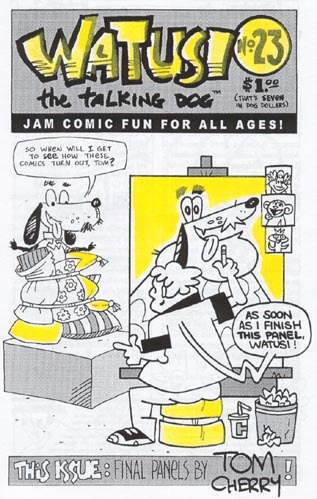 In issue # 23, Dale gave me the opportunity to complete the final panels for a handful of his fun jam comics and I did my best to fulfill his challenge! It was a lot of fun and I'm still honored Dale offered me a chance to finish some of Watusi's misadventures. Thanks again, Dale!